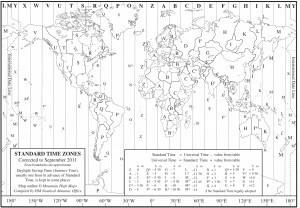 Have you ever seen a time zone map? Its a rectangular projection of our globe, like most maps, where small distances at the poles are stretched for thousands of miles and large distances at the equator look tiny by comparison. But my preference for globes is not the focus of this article. 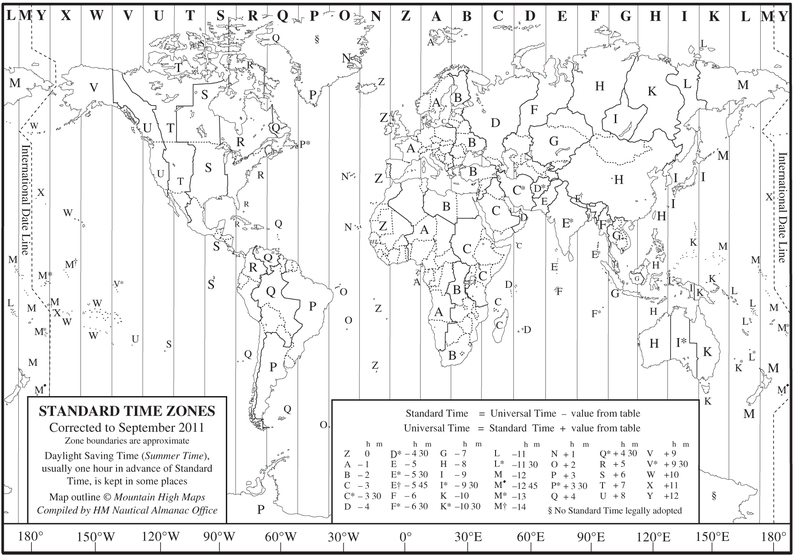 The time zone map has twenty-eight vertical lines showing the time from “Universal Time minus fourteen” to “Universal Time plus twelve”. And somewhere in between is the International Date Line. Universal Time is the same as the old Greenwich Mean Time in the Winter, but Greenwich (the United Kingdom) jumps ahead by an hour in the Summer for “Daylight Savings Time”, as do many other, but not all time zones. Other time zones that jump forward and fall back with the seasons do not always do it on the same week of the year, and many areas closer to the tropics do not change their clocks at all. Add to this the odd thirty minute time zones and forty-five minute time zones that are observed in some countries, and the H zone, or UT+8, which the whole of China follows despite the vast distance from West to East, and some places in the Pacific that have UT minus fourteen so they can match their date with other related islands, and we have a world with a giant mess of silly time zones. We civilized humans are an adaptable bunch of animals. Each year most of us adapt twice, when we move the clocks forward in Spring and back in the Autumn. And we twirl our watch crowns whenever we take a long flight across lines of longitude. Nothing bad happens when we change our clocks and watches. So why don’t we consider one major change, once and for all and stay with it? Why don’t we do what airline pilots already do? Why don’t we adopt Universal Time for every place on the planet, and stop changing it with the season, or the longitude? Yes it may be strange at first to wake up at 15:00 instead of 7 AM in Los Angeles, or go to bed at 04:00 instead of at 11PM in Boston. And it may be strange at first to have one daylight work day spanning two calendar dates. But there are many advantages for the time and date to be the same everywhere on earth. It would really help The Republic of Kiribati, which currently has to bend the imaginary International Date Line like giant snake in order to have the entire nation of islands on the same date. and it would really help large wide countries such as China, Russia, Canada, Australia and the United States. It would make daylight and actual days as perceived from where we are in the world more important than the numbers on a clock. We would be farmers, harvesting the light of the day. We would still rise somewhere near dawn and retire sometime after sunset, and we would still sleep in the dark, but the clocks around the world would all be the same. 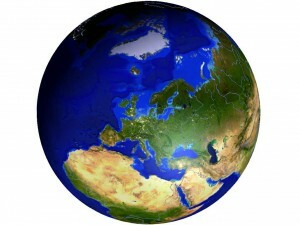 The British would still be the lucky ones to have the sun at its zenith at noon on the clock, as they are today in the winter months only, but the rest of us would quickly get used to living by the sun and having an international standard for time in the new modern globalized society that we do business in. What do you think? Please leave comments with your agreement with, or opposition to this proposal. NextNext post: What is in that dust? That’s an interesting proposal. I’ve never heard of it before. My only initial thought would be that some countries would spend much of their working day in darkness though – surely that’s not very acceptable. No they would still work in the daylight as they do now. Only the clocks would be set to Universal Time, and the date would change at 24:00 UT which may fall during their daylight workday. Wouldn’t this mess up our inner body clocks? Our brain gets messages as to when to go to bed as the dark sky ‘tells’ us so. Who would benefit most from this? Would it be business? I understand what your are putting forth, just not sure how practical it would be. And, yes, I do disagree with the idea. But everyone would still rise with the sun and sleep in the dark. Just the time on the clock would be the same everywhere. If you were in Los Angeles, for example, you would get up at dawn, but instead of the clock saying 07:00 it would say 15:00. This article made me think about the Jewish sabbath and how it would be affected if UT was standard everywhere. I think it would help because then we could observe from Sunset Friday to Sunset Saturday as in ancient times. After all, the time zones are so wide in longitude that the official times are never spot on if you are at the Eastern or Western edge of a time zone. So we would go back to heralding the start and end of a religious day by aligning the time with the actual sunset in the exact location where we are. Perhaps it could even begin freeing us from the manufactured structure of the universal 9-5 or 8-5 workday. I have long believed that if organizations allowed employees to set their own workday schedules (come in when you want and leave when you want as long as you work a total of 8 hours some time between 6 a.m. and 9 p.m.), it would increase productivity and reduce traffic and auto-related pollution. If some employees are working 6a – 3p, some are working 10a – 6p and others are working 1p – 9p, they are better able to accommodate their own personal lives and you avoid the gridlock that occurs when everyone is trying to arrive to work at the same exact time. If there was no universal daylight-hour 9 – 5, perhaps companies would begin looking beyond that contrived convention. @CRG. Point understood, but adopting universal time would not change the situation of all employees being present together during the same hours if that’s what they do presently. Only the time on the clock would be different. But my hope was that it might be a way to open the door to that discussion. If a company has to sit down and change their official office hours from “9a – 5p” to “1700-0300” (I think I calculated that right for Pacific time), it might be an opportunity to look more closely at WHY 9a-5p (or 1700-0300) is so sacred in the first place. I get it, but even companies that are open 24 hours like to have their core staff present at the same time for meetings, interactions etc. And so the normal traditional workday helps interaction within a firm and ready contact between different firms. However I agree that for some jobs it matters not which part of the day a worker works, especially considering globalization of business. Hello! I found your blog because I had the same idea and, thinking that surely someone else had thought of it previously (and you had), went looking for it. With the technology that we now have (smart phones, GPS), coordination and keeping track wouldn’t be a huge problem, but it would really screw up the old folks (like me) who still rely on a calendar on the fridge. You are right. We may have to keep the traditional local time but just be aware of Universal time and date at any moment. I’m still waiting for you to explain the actual daily benefit of this plan. I don’t, in fact, see one. Are time zones confusing? Yes, if you have need to study them. 99.999% of the people on the planet… don’t. Therefore, the issue is a complete non-issue to virtually everyone. So, why upset the apple cart just to make that .001% of people more comfortable? It would be an expensive change (lots of signs and paperwork would need to be altered. That’s not cheap. ), for no discernible improvement in… well, anything at all. Most businessmen, world-wide, work the same hours (roughly). Those hours being 8-4 or 9-5 (not counting overtime). Many businessmen travel. With your system, those traveling businessmen will now have to keep track of something new: What hour do businesses open where I am now? See, businesses do not run based on the sun: they run based on a clock. It might be light out at 8:30 am in Los Angeles… but if the business you’re trying to visit opens at 9:00 am, you still aren’t going to get in. So, now, instead of the time being intuitive, it has just become something you actually have to pay attention to CONSTANTLY, if you travel. By your system, that business would open at 1400 in New York, and 1700 in Los Angeles, and now you, the businessman (or tourist, or what-have-you), have to figure that out, instead of knowing that businesses in both places generally are open at 9:00 am. You’ve put the onus of keeping track of the time on the person, rather than on their watch (which is what we built the stupid things for…), which they currently change once (and then change back when they get home), and forget about it. Further there is a psychological issue to be considered. If you say “noon” to someone, everyone (who understands the word “noon” to be English for 12pm, local time) will have the same idea in their head of what you’re talking about. The same is to be said for 9pm or 3am, or any such time. The system you propose completely rips this to shreds, as 2100 hours would have no “meaning”, since it would be a different time of solar day for everyone on the planet. “Noon” would probably change to mean “When the sun is at its highest”, but that wouldn’t help all the other time references. This problem would be compounded (again) for travelers, who, growing up in one location, would have a visceral reaction to certain times. If they then traveled to a different location, where those times don’t mean the same, it would be confusing and uncomfortable. For instance, let’s say you live in LA, and you normally get up at 6am, which would be 1400 in your system. You are certainly NOT used to being up at 1100 (3am). Now, you travel to New York, where 6am is now… 1100. There WILL BE a visceral reaction to those travelers, who feel that at 1100, they should still be sound asleep in bed. People these days increasingly live by the clock, and in a technological world, that is a REQUIREMENT. So, in short: To people who stay in their home city most of the time, this is a complete non-issue. To people who travel, your plan makes their life more difficult. So, I repeat, where is the benefit to what you’re prescribing? And on a technical note as it relates to your article, Beijing is UT+8, not UT-8. Thank you for your detailed comment and especially for the correction. I had China 16 hours off (now corrected) which is inexcusable as I talk to someone there every day and should know better. I do not disagree with you at all and in fact my intent was to encourage debate and at least some consideration of how we perceive and measure time around the world.